The oil market failed to make any notable movements yesterday, with WTI crude oil ending just 8 cents above its opening price. Today, that inactivity continues, with prices dropping just slightly lower. Refineries in the Gulf Coast have been struggling with freezing temperatures, and its affected operations and caused shut-ins for some plants. Crude prices are currently down 9 cents, trading at $63.88. Gasoline prices soared 1.7 cents yesterday, boosted by API data showing a smaller than expected build in inventories. The refinery outages in the Gulf Coast also contributed. Today, in anticipation of the EIA’s inventory report, gasoline prices are trading flat, up 0.2 cents to trade at $1.8603. Diesel prices have struggled to make any headway higher, adding just 0.3 cents yesterday on higher crude prices. Today, prices are dropping quickly. After performing strongly over the past few weeks, diesel appears to have hit its peak and is now returning to more normal (lower) levels. Diesel prices are currently down 1.6 cents, giving a price of $2.0533. OPEC released their Monthly Oil Market Report this morning. The main takeaway from the report was the upward revision of U.S. crude production, which was increased by an additional 110 kbpd in 2018. Global oil demand was revised slightly higher as well, so the report has not had a major impact on markets this morning. Yesterday, the American Petroleum Institute (API) released its expected inventory data for the past week. The data was slightly more bullish than markets expected, with American crude stocks falling 5.1 million barrels, while gasoline and diesel together rose just 2.4 million barrels. The report helped propel gasoline prices higher, though crude and diesel were less notable changes. Markets will watch the EIA report released this morning to see if it corroborates the API data. The crude rally has yet to show any signs of a major reversal, despite slowing over the past few days. With net speculative length at record highs (for a refresher on net speculative length and CFTC data, click here), analysts have been calling for a price correction since early December. Why have we been able to reach such high levels? One publication (subscription required) speculates that hedge fund managers haven’t slowed down yet because prices are still historically low. In 2014, with prices over $100/bbl, fewer contracts produced higher margins. 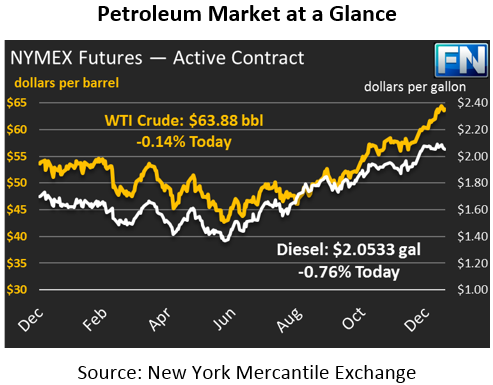 With WTI prices hovering around $65 now, more contracts must be bought to generate comparable returns. In addition, fundamentals are finally supporting higher prices, unlike in February 2017 when inventories were higher and markets were still unbalanced. Given those two factors, bullish sentiment could continue for a little bit longer before markets truly become overextended. And the higher it gets before reversing, the higher it will be after it crashes. For those hanging on the sidelines of the market looking for a chance to lock in fuel price, now may be as good a time as any to pull the trigger. Markets are incredibly unpredictable, and you never know what could send prices even higher.